A connection between your joint replacement and upcoming dental work might not seem relevant, but it’s actually extremely important. In a process known as antibiotic prophylaxis, joint replacement patients need to undergo premedication with antibiotics before undergoing teeth cleaning, tooth extractions, root canals, and other dental procedures. If you have any type of joint replacement, you should be aware of the following information before your next dental appointment. Antibiotics are used to treat bacterial infections. They kill dangerous and unhealthy bacteria to protect the body and make it less vulnerable to additional infection. Though antibiotics are most frequently recommended as a treatment after a specific condition has been diagnosed, it is common for dentists to require joint replacement patients to take antibiotics as a preventative measure before their dental appointment. This is called antibiotic prophylaxis. How Does Antibiotic Prophylaxis Protect Patients? 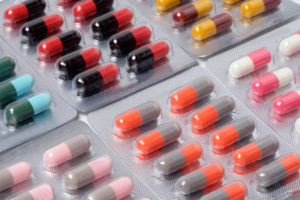 The use of antibiotics before a dental treatment decreases the chance of infection since some dental treatments cause bacteria from the mouth to enter the bloodstream. Antibiotic prophylaxis protects joint replacement patients who might be at risk of oral bacteria triggering infection somewhere else in the body. Do You Need Antibiotic Prophylaxis? Only your doctor and dentist can determine if antibiotic prophylaxis is the best decision for your health. Based on your health background, current health conditions, and specific dental procedure needed, Dr. Tadros at Dental Implant Solutionz in Largo, Florida can advise you on the need for antibiotics before your upcoming treatment. Call (727) 202-4926 now to make your appointment.